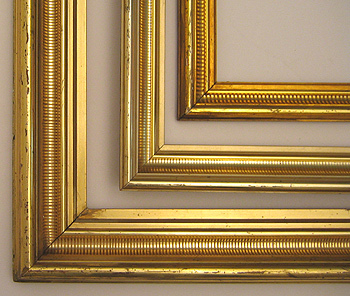 We maintain a large, ever-changing inventory of over 500 19th c. gilt frames. They are in good condition, without major repairs. 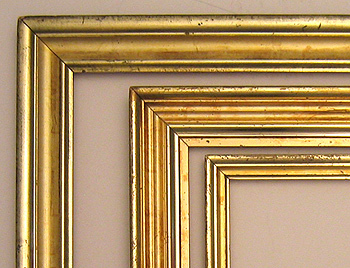 Our antique frames are in assorted sizes, with openings (rabbet sizes) from 8×10 in. to 30×40 in. Some are even smaller or larger than these sizes. Prices generally range from $175 to $2,500, with a few higher. 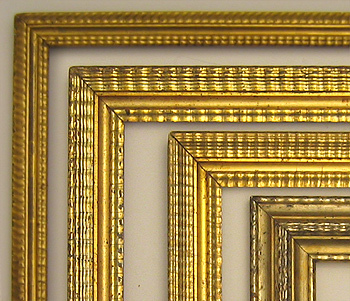 Examples of these antique frames can be seen in many museums displaying early American paintings. Our intention is to illustrate general characteristics of several categories of these frames, with the hope that you will contact us about frames suitable to your needs. 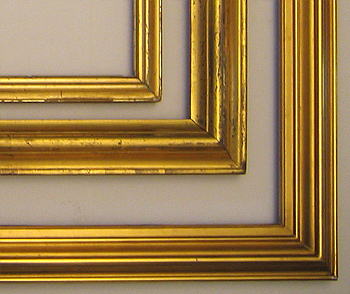 All our frames can be cut, if need be, to fit your painting. 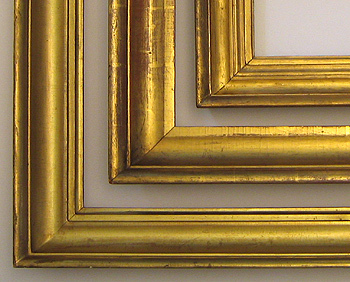 Since our frames are simple, they look good on much 20th century art as well. These American antique frames were made in the 1860’s. I call them the “classic form” because it is the dominant lemon gold form of the period. Initially most of these frames contained chromolithographs, other prints, and thinly hand-painted Hudson River scenes. Today these antique frames are in demand for a wide variety of paintings of the period and later decades, including for folk art frames, portrait frames, still life frames, and nautical frames. These American antique frames were made in the 1860’s, though some were made in the 1840’s as well. Their technical name, as I understand it, is astragal or bolection (or bolextion). Since these terms are not widely known among people who are looking for frames, I call their profile “hump in the middle’” and this seems to provide a useful description. 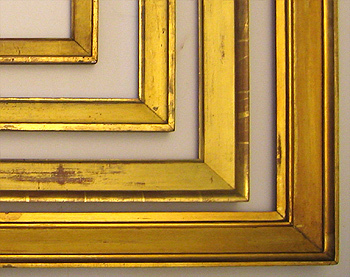 These antique frames were used on a wide variety of paintings. They are especially good as portrait frames, landscape frames, folk art frames, and mirror frames. These American antique frames were made as early as 1810-1815. They were often on portraits. They are in great demand, in part due to their scarcity. Later made frames, say in the 1840’s, emulated this form. These antique frames are particularly wonderful as portrait frames, and are rarely seen outside of museums and fine collections. These American antique frames were made around 1820, and continued to be made well into the 1800’s. They were often on portraits and other early oil paintings. Like early cove frames, they continued to be emulated, with variations. They are excellent as portrait frames, and are generally found in museums and fine art collections. These American antique frames were made in the middle 1800’s, starting from about 1850. They are often described as being influenced by earlier dark “Dutch ripple” frames. The majority of them are gilt, but I usually also have dark brown ones with gilt ripple liners. 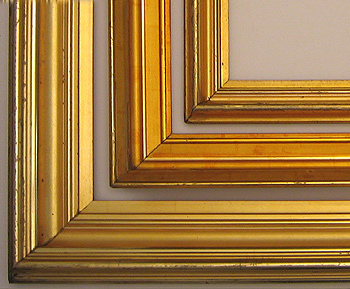 Everyone likes these frames, whether on paintings, as frames for mirrors, or simply to hang on the wall. These American antique frames were made in the 1870’s and a bit later. They typically have depth, i.e., if you set the frame on a table the outside edge is much higher than the inside edge. Some are cove-like. Others have some sharp steps and deep angled slopes. The latter are often gilded on the outside of the frame as well. These antique frames are especially good as folk art frames, landscape frames, and nautical frames. We normally have a few examples of other styles as well, including some painted frames.